There is very little in poker that can throw you off of your game in such a dramatic way as a bad beat can. Dropping from the high of being all in on the flop with top set against two over cards, to the low of being outdrawn to a runner-runner flush is enough to make the biggest poker fan hate the game. Despite this however, it is far more important than you think to deal with the frustration before playing your next hand. A bad beat by definition is simply losing a hand of poker when you were the statistical favorite. And really what is meant here is losing as the statistical favorite when big amounts of money go in the middle. A lot of people confuse bad play with bad beats. They are far from the same thing. For instance, calling off big bets on the turn and river when a major draw came in and your overpair is obviously no good anymore is in fact just bad play. How can you get over a bad beat? Understand equity and the realities of poker. Some players seem to think they are entitled to a pot, if you get it allin with a set vs a flush draw, you are going to be losing the pot approximately 27% of the time. That’s almost 1/3 of the time. Understanding that these things happen frequently in poker is critical to being able to not tilt when you get bad beat. Become process orientated not results orientated. Results orientated thinking are the downfall of many potentially talented poker players. Everything you should do in poker should be based around how to maximise your expectation in every given hand. If you associate losing with playing bad you are making a mistake. Its perfectly normal to play “perfect” and lose due to running bad and bad beats. Likewise, its perfectly possible to play awful and win on any given day. Don’t be results orientated, be process orientated! Without bad beats, the fish wouldn’t play! This is a critical realisation. You don’t get fish gambling on chess (A game where the most skilled player wins every game). The reason fish gamble playing poker is because they are convinced they can win on the days they get lucky, consequently they keep playing in the future despite being long term losing players. Variance and bad beats are what keep the fish playing because it gives them hope. If the fish were to loose every single hand, how long do you think they would play? Not long, that’s right! Just think of it like this, every time a fish bad beats you, you are giving them hope. They don’t understand odds, probability, ranges, value betting or any of the stuff that makes you a winning player. All they understand is winning and losing. When the fish wins, the fish keeps coming back. Its kinda cruel in a way, you give them hope when we both know they are going to lose a lot of money in the long run. Bad beats happen to everyone and are a way in which you can gain reciprocal profits on your opponents. Look at it like this, every bad beat is a test of your resolve, an opportunity to not tilt. If you don’t tilt in a situation when another player would have tilted, you have made some reciprocal money. Just as you can make money from your opponents by making better betting decisions, you can also make money in regards to tilting. If you don’t tilt, and your opponents tilt, you win! Every single player in the world has a breaking point. The breaking point is an imaginary amount of money you have to lose, or situations that have to happen to cause someone to play irrationally. The key is to be aware of your emotions and be able to stop playing when you reach that point. Remember, poker is supposed to be a fun and profitable way to spend your time. Any time in which your not having fun and are not playing your best, its best to quit, take a break, re-group and come back playing stronger, better and more profitably. Bad beats are an integral part of poker, so if you want to become a long term winner you are going to have to get used to them. 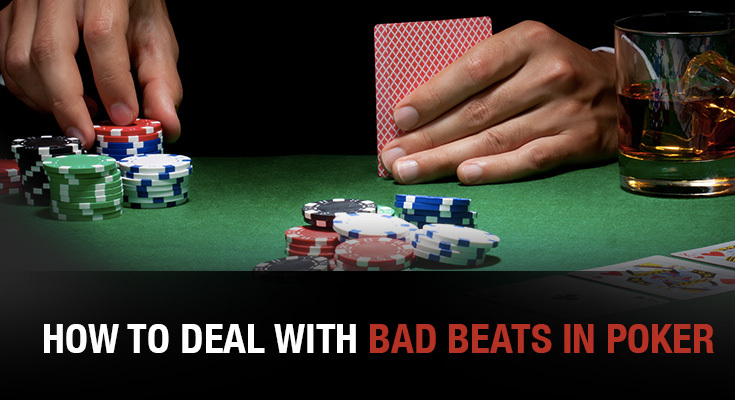 If there were no such things as bad beats, then most of us would never have a losing session. But on the positive side, bad beats are what keep the bad players and soft competition coming back. It tricks them into thinking they made the right play, or that poker is always about luck. Get all the latest Sports News and updates on your social media outlets.